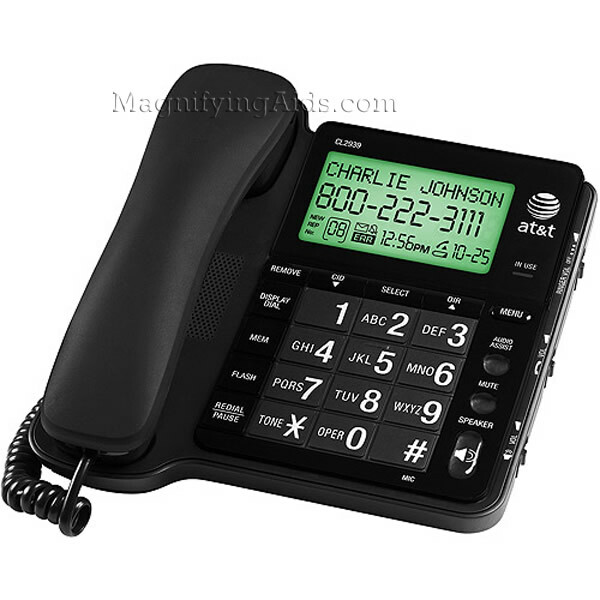 AT&T corded telephones is designed for those who want just a basic phone that's reliable and easy to use. Easy to see extra large buttons for dialing and an extra large tilt caller id display. The receiver and speakerphone have a volume control for hearing impaired and extra loud ringer. Product Features: Extra Large Tilt Display for Easy Viewing. Audio Assist. Speakerphone. No AC Power Required. 25 Name/Number Phonebook Directory. Receiver/Speakerphone. Volume Control Ringer. Volume Control. 10 Number Speed Dial Extra Large Buttons. English/Spanish/French Setup Menu. Mute, Redial, Flash. Table/Wall Mountable. Hearing Aid Compatible. Product Dimensions: 7.67" x 3.50" x 8.66". Weight: 1.5 lbs.